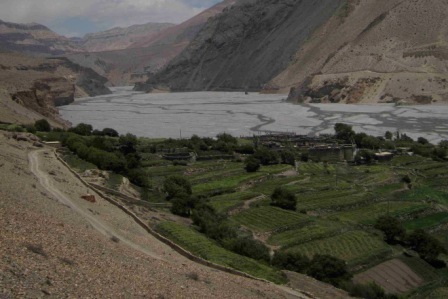 As a result of Chinese government concerns over illegal crossings of the Tibet – Nepal border, the Dolpo region of Nepal has, until recently, been one of a number of off-limit areas. Often thought of as the most magical and mysterious part of the Himalayas, this remote and isolated region now presents an intriguing opportunity for trekkers seeking a unique adventure. What do you do when you find yourself in a stare down with an 800lb yak? Its horns like crescent moons arching to the heavens. Sleek and ominous. Pierced nose, testament to a life of pain and labour? What do you do when you trace the line from its nostril along a length of hand-spun twine and notice it’s anchored to a rock, no larger than the size of a human fist? Weighing no more than your mud trodden sneaker? What do you do when you ponder over the purpose of the rock and whether it’s there to protect the yak from being stolen or whether it’s simply a thoughtful, yet woefully inadequate, means of protecting trekkers from being gouged to death? These are not questions I asked myself much prior to my Great Himalaya Trail trek, but by the end I was confident of the answer: don’t make it angry! My GHT trek was rich in experience and story, but of all the areas I traversed, no other place stands out more fondly than that of Upper Dolpo. I spent ten exhausting and exhilarating days exploring its wilderness, in the process climbing nine 5000m passes and going without resupply for 350km. They were by far the hardest miles I’ve endured, yet I came away with a much greater understanding of the topography of Nepal and a much more developed understanding of its people. Dolpo is home to Nepal’s largest district and the term ‘large’ can almost universally be applied to the area. It contains Nepal’s largest National Park, Shey Phoksundo, where you can lay witness to the azure ripples of what is arguably the most alluring lake in Nepal, Lake Phoksundo. In Dolpo, you’ll find yourself nestled among towering 7500m peaks, wandering along arid valley bottoms, some 20,000 plummeting feet below. You’ll notice Dhaulagiri, the world’s 7th largest peak, a constant presence, sitting like a beacon to your south. A reminder, if you ever needed one, that you are right in the heart of the tallest mountain range on earth. And if the mountains alone aren’t enough to lure you in, there is much to experience within the culture and people of these hills. Few other places will grant you the warm-hearted and genuine welcome the curious people of Dolpo will. Hundreds of pilgrims make the journey every year to the 11th century monastery, Shey Gompa, to make a ‘kora’ or circuit around the ‘Crystal Mountain’, Nepal’s own version of Mt Kailas. 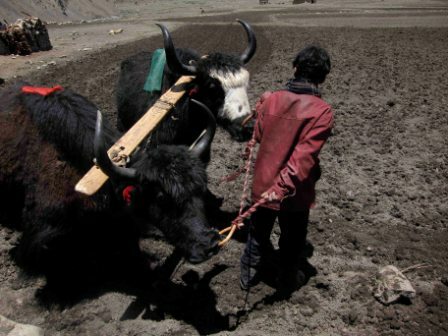 And perhaps most impressive is how the people have been able to transform their arid landscape into a cultivated reality, with terraced fields, makeshift greenhouses, hydro-powered grain mills, solar panels and yak powered plows all making for a very efficient and sustainable community. One look at the intricately detailed woodwork on the homes will tell you something about their craftsmanship, and when you realise it’s a three day walk to the nearest forest for lumber, you come to appreciate how passionate the people of Dolpo are and how proud they are to call it their home. So, what’s the catch you say? Well, while Dolpo is still a relatively cheap trek compared to some other destinations, the permit prices are higher than other areas of Nepal. You will have to pay around $500 for 10 days and $50 for each additional day in Upper Dolpo. You can be certain though that you will not regret having paid this, and the fact that 60% of the permit fee is given back to the people of Dolpo, allows you peace of mind, knowing that your trek is providing some assistance to this special place. As well as the cost, another consideration must be the type of trek you are looking for. 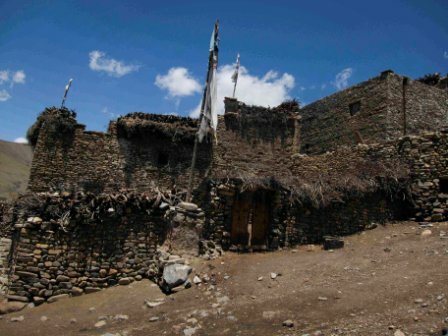 Dolpo is cut-off from much of Nepal and currently has very little infrastructure. Having only recently opened to trekkers and tourism, there are few teahouses and any accommodation you find will be very basic. If you are looking for a classic tea-house trek, then Dolpo might not be for you. However, while the lack of development may put some people off, it also provides the main attraction for others. You’ll find Dolpo to be void of the crowds of Everest and Annapurna and there is a very real likelihood that you will not see another trekking party during your time there. In this sense, it provides an opportunity to experience a real sense of isolation and adventure, something akin to the Nepal trekking experience of forty or fifty years ago. And happily, the lack of crowds will also increase your chances of seeing one of the elusive and endangered Snow Leopards, a Musk Deer or a Tibetan Wolf. If you are considering an adventure in Dolpo I would suggested giving yourself at least two weeks to allow you to fully explore the area while leaving time to acclimatize. A possible itinerary could be a loop from Dunai to the village of Dho Tarap (accessed by the dirt airstrip in Juphal). From Dho Tarap across two 5000m passes, Numa La and Baga La, which offer panoramic views of the area and entry into the quaint village of Ringmo and Lake Phoksumdo. Then make the short trek to Shey Gompa to the north, before rounding off your circuit back in Dunai. Just be sure to watch out for those Yaks! Trekking in the Himalayas gives you access to the most stunning mountain scenery on earth for relatively little cost, but unless you take the necessary precautions relating to altitude, there can be a hidden price to pay. For everyone who ventures into the higher regions of the Himalayas, from experienced mountaineers tackling 8000m peaks, to those on short, leisurely treks, dealing with altitude should be given careful consideration. To help you in understanding something of the dangers of altitude and the possible approaches to managing this danger, today’s post provides a summary, along with a list of dos and don’ts for high altitude adventure. At altitude, low pressure means that the concentration of oxygen in the air is reduced. The higher you go, the lower the pressure and the less oxygen you will take-in with each breath. The effect of this reduction on the body can lead to what is known as Altitude Sickness or Acute Mountain Sickness. The primary symptoms of altitude sickness are not uncommon amongst trekkers and climbers venturing over 2,500m (8,000ft). They include: headaches, shortness of breath, insomnia, fatigue and lack of appetite. You can view a full list of possible symptoms by visiting the NHS website. If, during your trek, you recognise that you have developed some of these symptoms, it does not necessarily spell the end of your trip, but what it does tell you is that your body is having a hard time adjusting and that you should slow your ascent to allow sufficient time for acclimatisation. In the worst cases, altitude sickness can turn into the severe and life-threatening conditions of High Altitude Pulmonary or Cerebral Oedema, which result from people ascending too fast, ignoring their primary symptoms or spending prolonged periods at very high altitude. 1. Drink plenty of water and drink regularly to keep your body hydrated. 2. Don’t drink alcohol as this will dehydrate your body. If you do, be very careful about the amount you consume as you will feel its effects much more readily than at sea-level. 3. Eat well and often. Very few people will put-on weight during a Himalayan trek, so forget about your waistline for a few weeks and keep those energy levels up. 4. If you have a choice, sleep at the lowest altitude possible, as the effects of altitude sickness are usually felt most strongly when sleeping high. Try and plan your trek so that you walk high in the day and sleep low. 5. Don’t go up too fast – this is the primary cause of altitude sickness. Try and plan so as not sleep more than 300m higher than you slept the previous night. 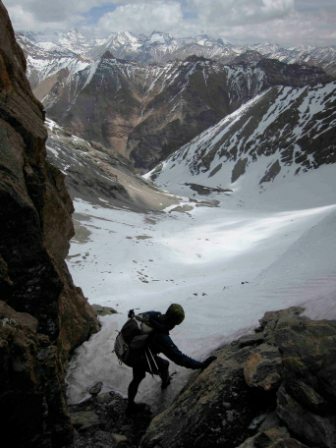 This may not be possible on some Himalayan treks, but this should be your aim. 6. Take extra care if using vehicles to travel to altitude, as the speed of the ascent will be faster and your body will have less time to acclimatise. 7. If you’re somebody who is very competitive, forget about machismo while you’re up high. Fit, young men are the most common casualties of altitude due largely to over-exuberance. It’s important to remember that it is your attitude towards altitude that will ensure you stay healthy and not necessarily your physical fitness. 8. Each person reacts differently to altitude, so especially if it is your first time up high, take the time to understand your limits and don’t over-exert yourself. Acetazolamide, commonly known as Diamox, is a drug usually used in the treatment of the eye condition, glaucoma and epilepsy, but is also commonly used by trekkers and climbers to prevent symptoms of altitude sickness occurring. It works by increasing the acidity of the blood, which helps compensate for the effect of altitude, which makes the body more alkaline. For a detailed description of the drug, you can visit the NHS website which has detailed medicine guides. We would advise you to consult your GP before taking this drug and ensure that you buy it from a chemist at home, rather than cheaply in Himalayan mountain towns. For those who choose to take it, be sure to be clear about the recommended dosage and be aware that there can be side-effects from taking Diamox, most commonly numb feet and hands, pins and needles and the need to urinate more frequently. The latter being something of an annoyance at 4am, when it’s -10C outside and you’re tucked-up in your sleeping bag! Of course, the essence of the Himalayas is not about things you shouldn’t do, it’s about what you should do! It’s about challenging yourself to go somewhere special and memorable (albeit by taking a sensible and considered approach to getting there!). So, with this in-mind, we’ve made a short list of our Himalayan high points, to give you a little inspiration. If you’ve already been lucky enough to experience these places and would like to have a conversation about finding some alternative altitude, don’t hesitate to contact us, as we have lots of good ideas! 1. Everest Summit (8,848m) – OK, strictly this is cheating, but you can book your flight around the summit of Everest through Swoop. Flying close to the highest peaks in the world is really not to be missed. 2. Mera Peak Summit (6474m) – Mera is the highest of the trekking peaks in Nepal and affords you spectacular views of five of the world’s 8,000m peaks. 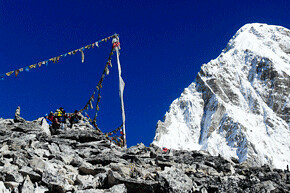 Mera is a non-technical snow climb and can be scaled in a 16 day round trip from Kathmandu. 3. Island Peak Summit (6,189m) – Usually preceded by an acclimatisation trek to the top of Kala Pattar, Island Peak is the most popular trekking peak in Nepal. As well as a stern physical test, Island Peak will provide some truly spectacular views across to the Everest massif in the north and Ama Dablam to the south. 4. Lobuche East Summit (6119m) – This less climbed peak sits on the divide between the Khumbu and Gokyo valleys, providing unforgettable views across the Everest region. Lobuche East is a slightly more technical peak than Island or Mera. 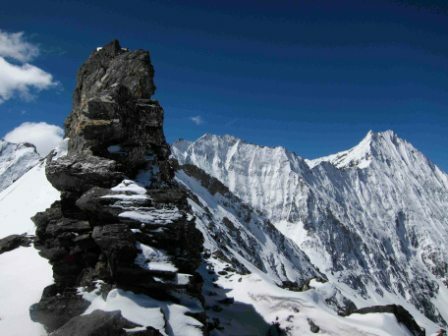 It can be scaled as an extension to either the Gokyo Lakes or Everest Base Camp treks. 5. Gokyo Ri and Kala Pattar (5357m, 5545m) – Gokyo Ri and Kala Pattar provide the respective high points for the Gokyo Lakes and Everest Base Camp treks. These peaks are as high as the majority of the world’s trekkers will venture, while also being useful acclimatisation peaks for a hardy few.